New for 2010 is a line of kids toys that use super-absorbent polymers to grow "Orbeez" - tiny spheres the size of a small sprinkle - to over 300 times their size. The basis technology is pretty simple, and has been around since the 1940s for use in irrigation. The super-absorbent Orbeez are made of several molecules joined together which are able to attract and store moisture in the space between their molecules. What this means for kids is what starts as a tiny floating sphere can become a marble-sized ball of fun within three hours. The Orbeez line has now includes the "Magic Maker" an Orbeez grower that will let kids play with their toys all the way from the initial wet stage to the finished product. The Magic Maker is essentially a large plastic container that comes with suspended rings that kids can use to shoot their Orbeez through as they grow, and at the top of the Magic Maker is a squeeze ball which will send all of the Orbeez in the Maker swimming. 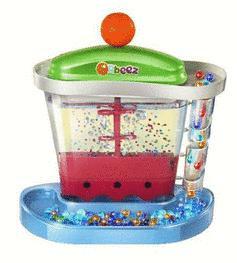 Once ready for use, the Orbeez can be popped out of the tank and slid down a spiral slide for more fun. The Magic Maker comes with 2500 Orbeez in 9 colors along with an activity booklet and a Plan n' Display Tray for the newly-grown Orbeez. Even when fully grown the Orbeez do not harden, but instead retain a certain moisture and flexibility. Orbeez that dry out can be re-hydrated, but they do not last forever - after a few weeks, Orbeez may began to mold or mildew and can be composted or churned into soil. The whole Orbeez concept is interesting - much like the "growing dinsours" of our youth, these have a short shelf life but are far more environmentally friendly than any of the toys made in the 80s and 90s - and they offer kids an ability to be playful and also see some science in action. Chatter on the Orbeez Web site is brisk, and it appears that the company is doing its best to not only support the Orbeez line, but come up with new and interesting ways to use the product. Buy the Magic Maker now at Amazon for $24.99. $weet Tweet$ or Social Experiment Gone Sour? I know this is a wonderful site- I really love to invent even though I am only a kid and this Orbeez thing seems so cool! the fact that they are flexible is way cool.